Wahlburgers Greektown Detroit review, pics, hours, and menu info. Wahlburgers is located in the heart of Greektown on Monroe Ave in Detroit, MI. I like a good burger and if anyone has potential to create a successful burger joint, you’d think a celebrity would stand a good chance of doing so in the competitive restaurant business because of Hollywood $$$. Plus, I heard they had spiked milkshakes and that sparked my interest. A friend and I went to the bi-level Wahlburgers in Greektown to test it all out. The menu is not complicated…Wahlburgers serves up burgers, sandwiches, salads, homemade dishes of macaroni salad, chili, and mac ‘n cheese, sides of French fries, onion rings, tater tots and sweet potato tater tots, kids menu options, desserts, and more. Also on the menu are fantastic drink options, frappes and floats. Because we ordered the burgers, tots and drinks…I’ll expand on those. 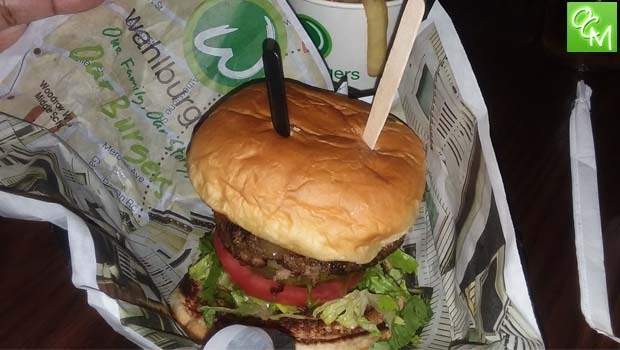 The burgers at Wahlburgers come with “government cheese” and the housemade signature wahl sauce. As much as I wanted to try the cheese (and the spiked milkshake), I opted out as dairy doesn’t like me very much. So, we went with a regular burger with the wahl sauce which is pretty much a Thousand Island dressing. We split a side of the sweet potato tator tots. And, after some very honest advice from our waitress, we ordered a couple of strawberry jalapeno margaritas (she strongly advised against the pineapple margarita that many customers were sending back). Out of all that we ordered, I must admit my favorite by far was the strawberry jalapeno margarita. As odd as it sounds, it was the best margarita I’ve ever had. I’d go back just for that, and am hoping it’s still on the menu. Aside from that, I thought the sweet potato tater tots were good because they had a nice crispy crunchy exterior and the perfect texture. Unfortunately, last on my list was the burger. What was supposed to be the highlight of my visit to Wahlburgers was merely average. The burger did not blow me away or want me coming back for another visit. For me, it was just another burger. But, I appreciate the different ways Wahlburgers offer the burgers – double decker, triple decker, BBQ bacon (white cheddar, bacon, jalapenos, BBQ sauce and avocado spread), the fiesta burger (southwestern rub, pepper jack cheese, salsa, chipotle mayo), and more… all made with fresh angus that is a blend of brisket, short rib and chuck. The casual atmosphere at Wahlburgers is decorated with lots of metals and an industrial feel, laced with the signature lime green.